Manicure Set is one of the most important set of tools in a girls life. For me it was even more important since I'm not blessed with naturally beautiful nails. My nails are short, prone to breakage & peel very easily. So I have to extra care of these. For this reason, I decided to give a try to one of the cheapest Manicure & Pedicure sets few months before since I had very little knowledge of these tools. 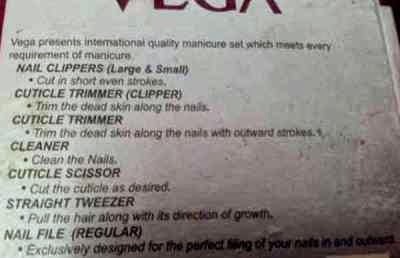 Being so unaware about the use & role of these Manicure tools, I bought the cheapest & the most easily available Vega Manicure Kit.This is one of the most popular brands when it comes to tools, makeup brushes and other makeup and beauty accessories, giving you a huge range of these stuff at an affordable price. I think most the Indians use Vega brush initially because they are so cheap. This Manicure Set of 8 Tools has been with me for few months and here is my review & experience with this. • Small Nail File : VEGA Nail file having two-sided nickel plated surface for smooth, gentle and perfect filing of your nails in and outward, and there shape is not torn. • Cuticle Trimmer Clipper : This cuticle trimmer keeps your nails cuticles looking at their absolute best. • Cuticle Scissor : VEGA deluxe cuticle scissors are specially designed to cut dead cuticles perfectly. The stainless steel elegant design with extra sharp, pointed tips and curved lades helps to trim the cuticles with precision. • Tweezers (Square-Tip) : Finest quality tweezers with hand filed square tip and precision, square flat tip with non-slip grip. Tips are hand polished and perfectly aligned to grab the hair every time. Perfect for removing ingrown hair. • Cuticle Trimmer with Pusher : This cuticle trimmer and pusher keeps your nails and cuticles looking at their absolute best. The angled end pushes back the cuticles and the metal-V end neatly trims away dead cuticles around the nails. • Nail Cleaner : Simple tool as professional to extract and cleaning under the nails. Perfect filling of your nails in and shape is not torn. This Vega Manicure Set of 8 Tools comes in a very simple flip open box which is very light and the flip opening is again very light. It does not really have the grip to hold on shut. Along with it I found it to be space occupying because of the thick box. I would have preferred it in a pouch form with different sections for each tool. So I'm not quite impressed with the packaging part. Normally I carry the essential one or two tools from it in a separate pouch rather than carrying this whole box while traveling. I have missed few tools somewhere and could give you a look at the few below. Now coming to the quality of the tools, which is again a little below expectation. Though quality of most of the tools being the nail clipper, cuticle trimmer, Nail Cleaner is quite good good but I'm not really satisfied with the quality of the scissor and the tweezer in the set. The scissor is difficult to hold, extremely delicate and it just broke with few usage and not up to the mark. The tweezer does its work in an average way but the points of its hair grabbing section are quite pointed and I never like pointed tweezers because they could hurt you accidentally specially of you are a beginner. I always prefer blunt eyebrow tweezers for pain free tweezing and for that reason I'm planning to buy Colorbar Flat Tip Tweezer very soon. 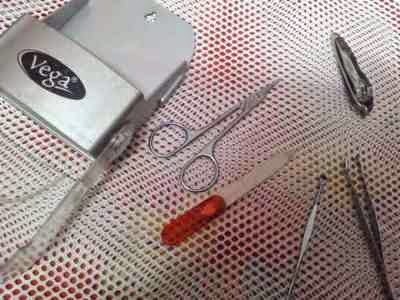 I will be very soon reviewing this Vega Eyebrow Tweezer in detail, so that you can have a better opinion about it. The nail filer is again not too good and feels blunt after few usage. Normally while traveling I don't carry the whole set of tools but just a tweezer, nail cleaner and a nail filer because I am quite satisfied with these tools and these actually complete my emergency manicure to some extent while traveling. I do carry the nail cutter sometimes since it's quite handy but it's requires a little effort to neatly cut the nails because it's not too sharp but can be managed in case of emergencies. Overall I think this Vega Manicure Set of 8 Tools is not a satisfying manicure kit and most of the tools are not up to the mark. But few most required tools and nail accessories are quite good to go with and also this comes at such a cheap price that I don't think one could get more than this in this much price. A single professional tweezer is more expensive than this whole set, so this definitely can't be complained. I would suggest you to try this kit if you are a beginner, so that once you have the knowledge of these tools you could go for the professional expensive tools after knowing better tool usage and your requirement. I love using different types of Vega Brush & its other products for anything new I want to try because they are so affordable and to update myself with the proper knowledge of the tools and kit. I would definitely be trying other variants of its manicure as well as pedicure kit the next time. Fulfill Manicure needs in case of emergencies. Quote good for beginners to try. Avialable in so many variants. Quality not up to the mark. Does not give a professional Manicure feel. 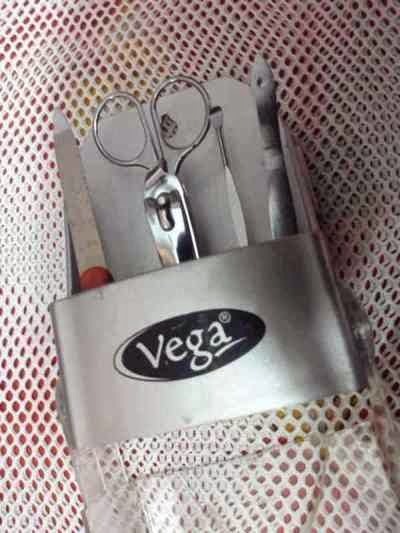 Vega Manicure Set of 8 Tools Review. Labels: VEGA, Vega Manicure Set of 8 Tools Review.